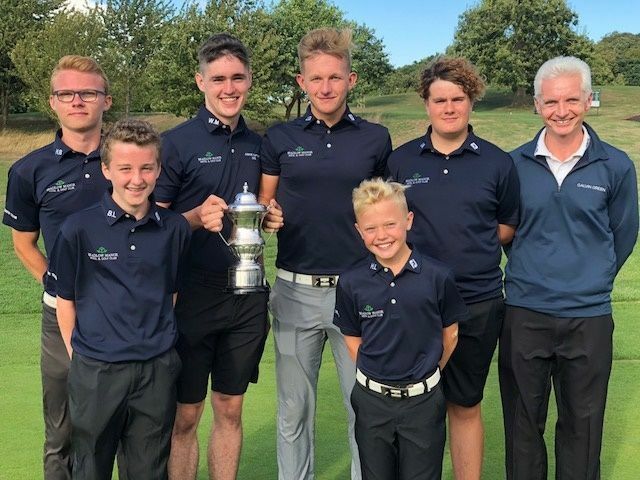 Teams of six juniors from Aspley Guise & Woburn Sands, Beadlow Manor, John O'Gaunt and Leighton Buzzard played in the final of the 2018 Tavistock Trophy at Bedfordshire Golf Club on Friday 24th August 2018. The Tavistock Trophy takes good account of scratch and handicap golf in it's scoring. The best two gross scores plus the best two nett scores from the other four players are used. The course at Bedfordshire GC was in great condition and the weather conditions, whilst typically windy at the start, became extremely challenging as the afternoon wore on. Some good scores were nonetheless posted which serves as an indicator that our young golfers know how to adapt their games. Eddie Stephenson from Leighton Buzzard took only 75 strokes to get around the course whilst Will Murray from Beadlow Manor shot a nett 68 which was 4 under handicap for the day. Well done to everyone who participated. Teams from Beadlow Manor have dominated this competition recently and nothing changed this year. They won the Trophy for the 6th year in succession. A great performance by the lads from Beadlow Manor and even more reason for the other clubs to try again next year. Who can produce a performance to take the trophy away from them? The 2018 Tavistock Trophy Champions - Beadlow Manor, pictured above. From left to right: Hayden Black, Ben Loveard, Will Murray (Captain), Jamie Gibbons, Harry Lake, Jack Munson and, Gary Boyle (Team Manager).